Hawaiian Koa wood ring with crushed Turquoise and copper Inlays and a copper band. 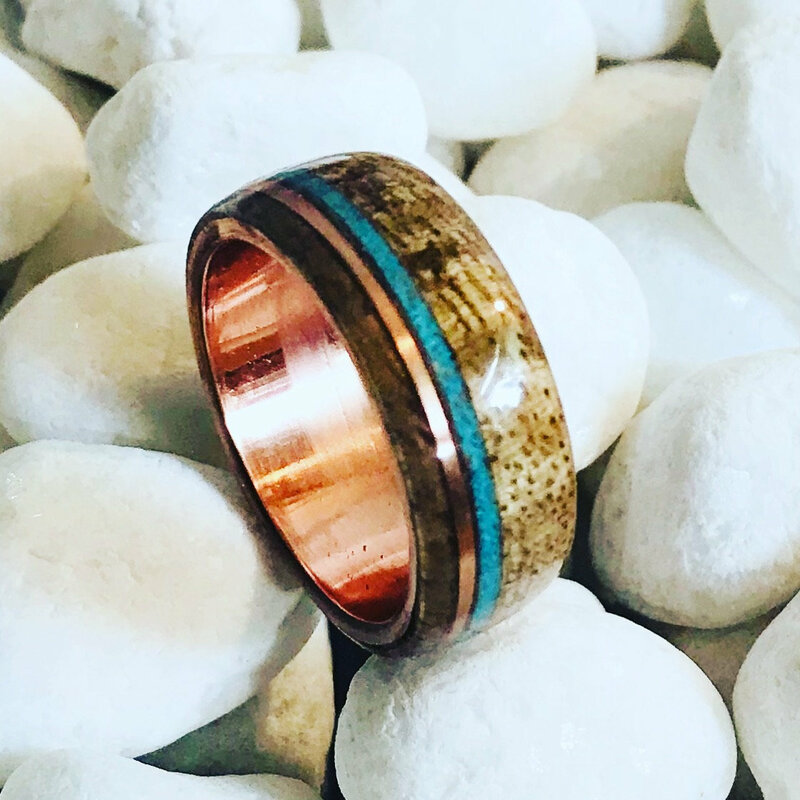 This beautiful Hawaiian Koa wood ring with crushed Turquoise and copper Inlays and a Copper Band is an absolute beauty. ***Our copper rings are coated with a clear thin resin to stop any oxidation. These coating can wear off at any time, should a green stain on your finger occur it is a natural oxidation from the copper and will wash off with soap and water. An easy fix is to cover the copper band that touches your skin with clear nail polish and let dry. This band is available in a width of 8mm. Each band is custom made and has its own unique wood grain. Each ring is milled from a solid wood piece to your ring size using a jeweler's mandrill. The wood is then shaped and polished. The wood is then encased in a strong acrylate, making a water-resistant and scratch resistant and ready for daily wear! This ring will be made to order in your size if you would like any other customization or general questions/suggestion feel free to send me a message! We handcraft your ring to your specific size, please be sure your ring size is accurate! We recommend a professional sizing by a local jeweler. All rings ship for free in the United States. Any additional taxes or tariffs on international orders are the responsibility of the buyer. If a ring is damaged in transit it can be returned for a full refund, we, however, cannot accept returns on rings with a misstated size from the buyer. We recommend having a jeweler check your size prior to purchase.